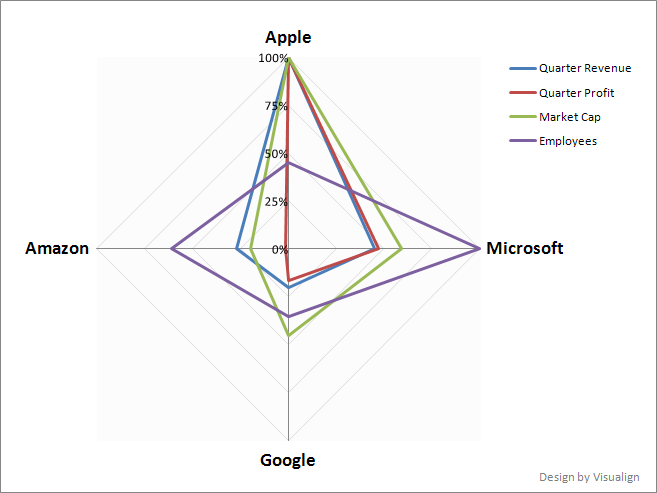 Ed Bott at ZDNet.com wrote a post with the title: Microsoft, Apple, and Google: where does the money come from? 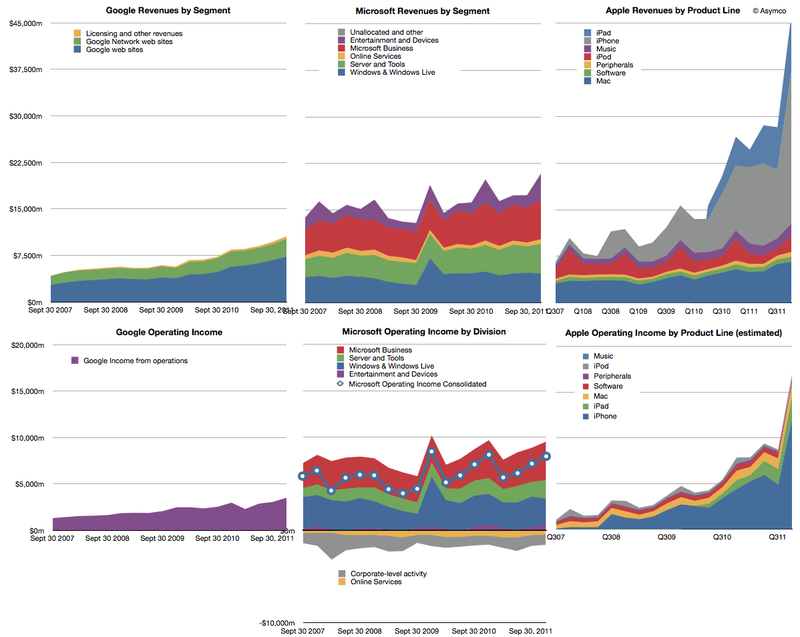 He looked at the quarterly reports of these companies (links to sources in the article) and displayed a pie-chart of the revenue mix for each of them. 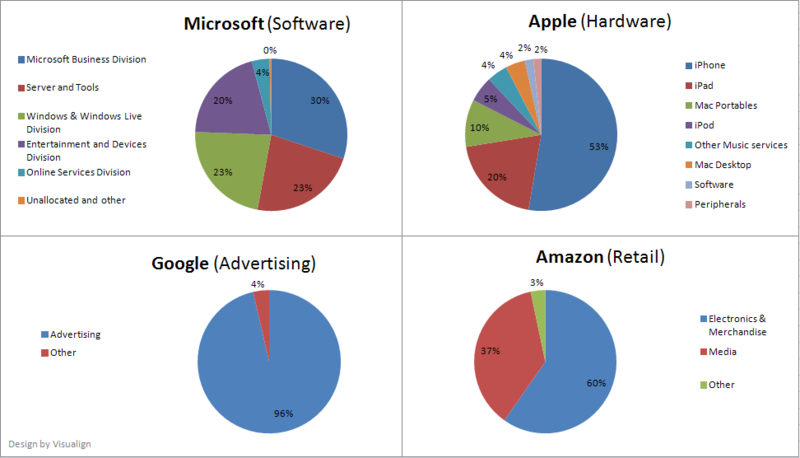 Inspired by that, I added a fourth company – Amazon (source: 10-K for 2011) – and aggregated those pie-charts into one graphic. Yet as a consumer I rarely think about these differences. All of them use state-of-the-art technologies like cloud-computing and mobile devices to achieve integrated end-to-end experiences geared to increase revenues in personal computing (Microsoft), smart mobile devices (Apple), online search (Google) or shopping (Amazon). And arguably all of them derive major competitive advantage from their software, such as Apple’s iOS which introduced the touch interface. Perhaps most surprising is Google’s almost singular reliance on advertising, which makes it a very different business model. They offer all their technology for free – from search to mapping to operating systems and social media – to grow and retain online attention as enabling condition for advertising revenue. For a business this big the near complete dependence on one source of revenue is unusual; perhaps its time for Google’s leadership to seriously consider a diversification strategy? 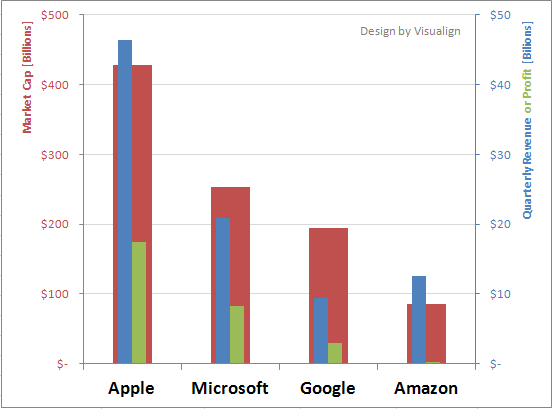 Without it Google is arguably more prone to disruption (such as from Facebook) than the other companies. Speaking of disruption: Apple derives almost 3/4 of its revenue (73%) from iPhone and iPad, neither of which existed 5 years ago. As Ed Bott points out, those two products now drive an astonishing $33.5b revenue per quarter! The article is called “The World’s Biggest Startup“. It’s main point is this: Microsoft and Google both grew their businesses steadily, but did not change their type of business. Apple did some of that in its established business segments, but more importantly and disruptively it added new categories (iPhone and iPad) for dramatic growth. That’s what startups do. Just so happens that Apple – whose stock today for the first time hit $500 – is also the most highly capitalized company in the world (around $460B). If Apple is a startup now, what will they look like when they are fully established?